Back Spin is a double-sided brainteaser that is truly revolutionary. This Oppenheim Award winning puzzle is shaped like a flying saucer with two halves that you twist to pass balls from one side to the other. Your job is to scramble the colored balls, then figure out how to get them back into their matching slots — on both sides. 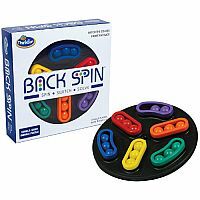 Back Spin might look simple at first, but this cleverly addictive puzzle could leave your head spinning. Measures approximately: 7.00 x 7.00 x 1.50 inches..